The Reading is not well remembered for its passenger services. The railroad, like many other Northeastern system, is best known for the vast tons of anthracite coal it moved from eastern/central Pennsylvania to the ports around Philadelphia and New York City. However, the Reading did have one notable passenger train that stood above its daily commuter rail services near Philadelphia, the Crusader. For nearly three decades this train proved quite successful serving the 90-mile corridor between Philly (at the company's Reading Terminal) and Jersey City (via the Central Railroad of New Jersey’s, Jersey City Terminal), even though it had stiff competition from other railroads like the Pennsylvania Railroad. This issue compounded with the traveling public switching to other modes of transportation the Reading gave up on the Crusader by the mid-1960s. The Reading Railroad (pronounced “Redding”) was another of the many anthracite carriers of the Northeast and perhaps the most famous (it was even featured in Monopoly!). Unfortunately, when demand began to disappear for this coal following WWII so did the Reading’s profits. Despite the fact that the railroad was one of several that collapsed in the wake of the Penn Central disaster, and eventually absorbed into Conrail, it was certainly one of the most interesting and colorful anthracite carriers. One other interesting aspect of the Reading was its extensive, electrified commuter operations around the Philadelphia area. By the 1930s the railroad had energized these lines, extending from its now-abandoned Reading Terminal (Philly) to Norristown, Chestnut Hill, Doylestown, Hatboro, and West Trenton. Amazingly, even as late as the 1960s the Reading was continuing to expand its commuter/electrified operations! 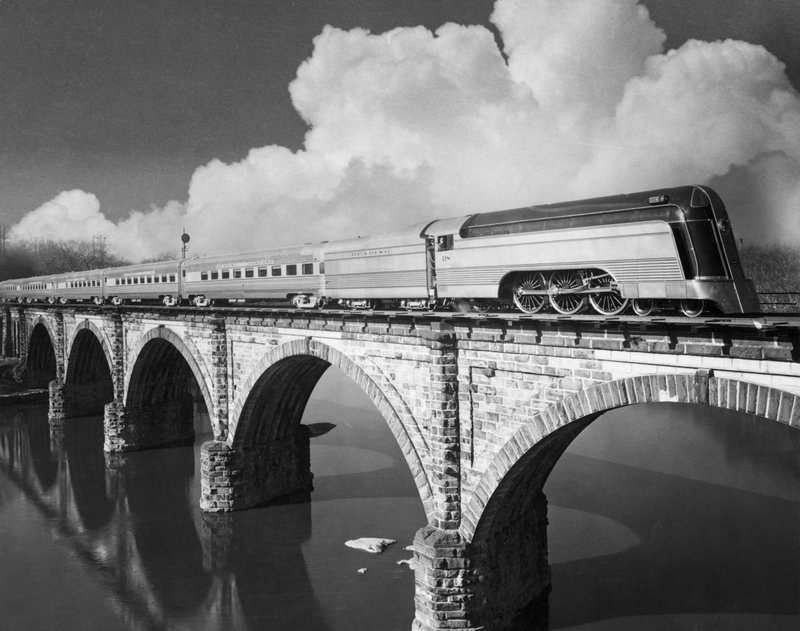 Despite its regional size the Reading entered the streamliner craze shortly after the Baltimore & Ohio reintroduced a sleek, shiny, and eye-catching Royal Blue between New York and Washington, D.C./Baltimore. 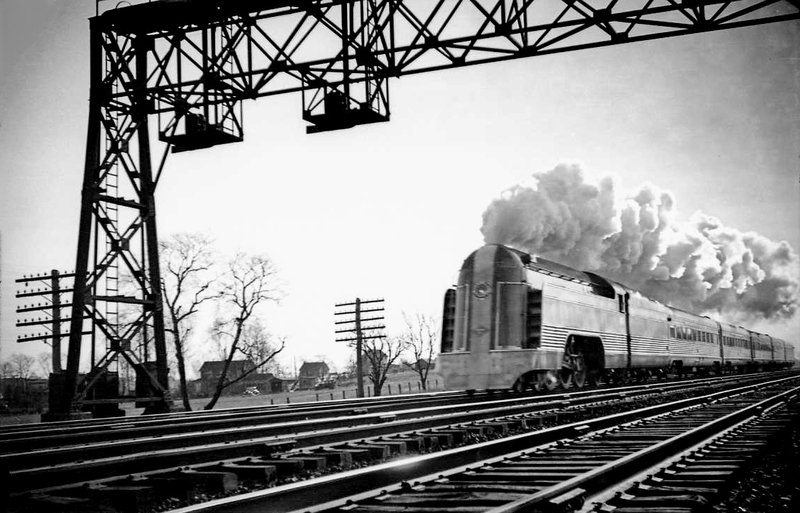 It debuted the Crusader between Philadelphia-Jersey City (connecting service into Manhattan was available via ferry) in December of 1937, featuring a five car consist in all-stainless steel built by the Budd Company. 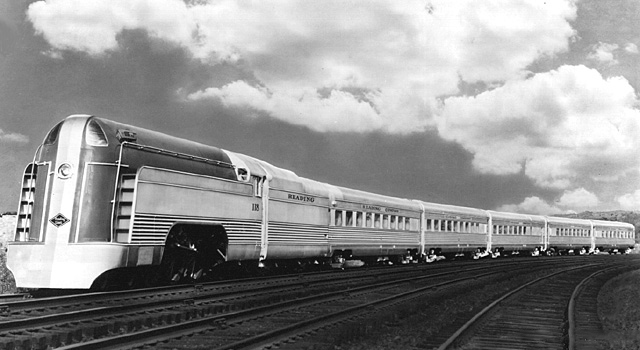 The train included a tavern-diner, reclining-seat coaches, a diner (with a cocktail lounge) and two lounge-observations (with smoking privileges) pulled by a 4-6-2 Pacific steam locomotive which was also streamlined in stainless steel featuring dark blue trim to match the rest of the consist. Of note, the Reading placed an observation on each end of the train thereby negated the need to turn the equipment prior to another run, which saved time. As a result the head-end power could simply run-around the cars, reequip and be on its way. While modest the train was very classy and touted as "Clad In Shining Armor" in advertisements to promote the new consist. It was well received by commuters as a secondary option to the somewhat mum services provided by the Pennsylvania. For instance, the Reading offered long-distance passenger train amenities aboard the Crusader, such as a full breakfast and tavern service (both of which were not normally available on commuter runs). Very fast, the Crusader could complete the 90-mile run in less than two-hours averaging nearly 50 mph the entire trip. The Pacifics did not last long as beginning in 1950 they were replaced by Electro-Motive FP7 diesels (eight in all were acquired by 1952 numbered 900-907), which were adorned in the Reading’s updated livery of black and green with yellow trim. While this new paint did not match the stainless-steel cars it was nevertheless a nice look. 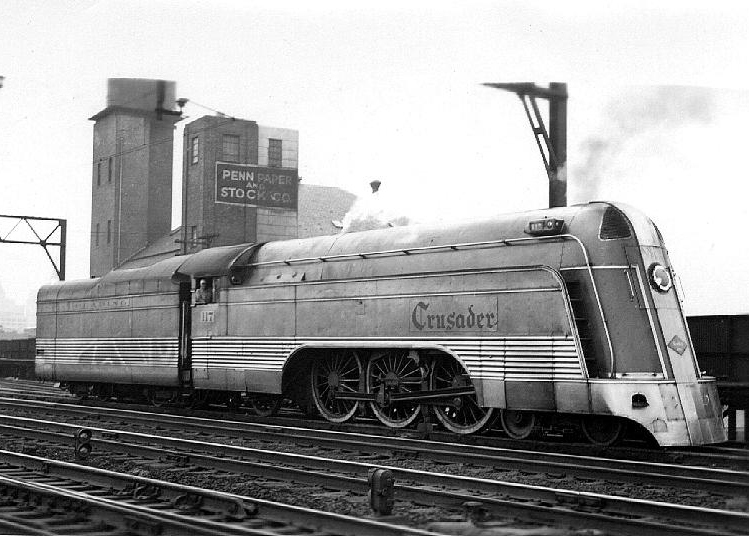 The Crusader's quality services allowed the train to do fairly well for the Reading through the 1950s. However, within a decade and in an already stiff Northeastern commuter market along with increased competition from automobiles and air lines the railroad cut back services on the train in a substantial way. In the end the Reading simply did not have the resources to compete against the larger railroads and it was already on a tight budget due to falling freight volume. In 1964 the entire streamlined train was sold off to the Canadian National and reequipped with heavyweight cars and later simply used the ubiquitous Rail Diesel Car. Because the Reading already operated significant commuter operations between Harrisburg, Philadelphia, Jersey City, and the New Jersey coastline (through subsidiary Pennsylvania-Reading Seashore Lines) the company was quite comfortable with using the RDC for continued service of the train between Jersey City and Philly. Of course, this meant once popular accommodations such as lounge and tavern services were sacrificed in the process. The RDC operations continued through nearly the end of the Reading era itself although by those days the classic amenities the original Crusader had offered were long gone by the time the equipment was sold to Canadian National.